With its restrained decoration, this small jar is the earliest example of Japanese pottery in the collection. 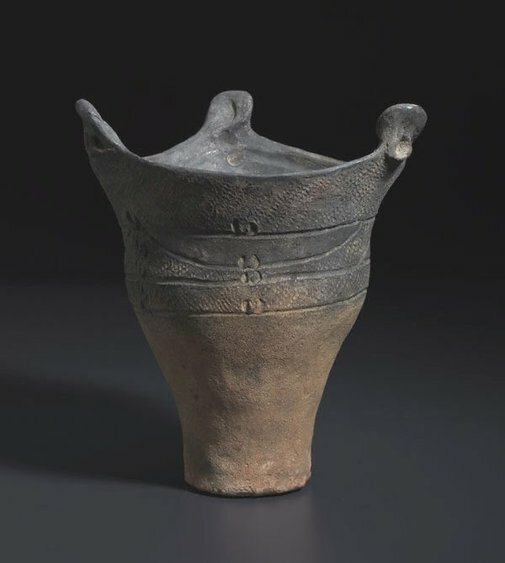 It's 'cord pattern', over-incised by wider lines, is typical of pottery made in the Kanto district (present-day Tokyo and environs) during the mid to late Jomon period. The patterns in Jomon pottery are thought to have meaning rather than being purely decorative, but their meanings are not known today. This type of jar was used to cook food, most likely half-buried in a fire, with the lugs functioning as handles. The Asian Collections, AGNSW, 2003, pg.260. The Asian Collections Art Gallery of New South Wales , 'Ceramics', Sydney, 2003, 260 (colour illus. ).